On July 16th, 1251, Our Blessed Mother appeared to Saint Simon Stock, General of the Carmelite Order, in answer to his plea for help. Mary held out to him a brown woolen scapular, saying, "Receive, my beloved son, the Scapular of your Order. It is the special sign of my favor, which I have obtained for you and your children of Mount Carmel. Whoever dies clothed with this Scapular shall be preserved from the eternal flames. It is a sign of salvation, a sure safeguard in danger, a pledge of peace and of my special protection until the end of the ages." Mary promised supernatural favors and special protection to the Carmelites and all who would wear the Brown Scapular. In 1910, Pope Saint Pius X authorized the use of a scapular medal portraying the Sacred Heart of Jesus on one side and on the other, Our Blessed Mother Mary. 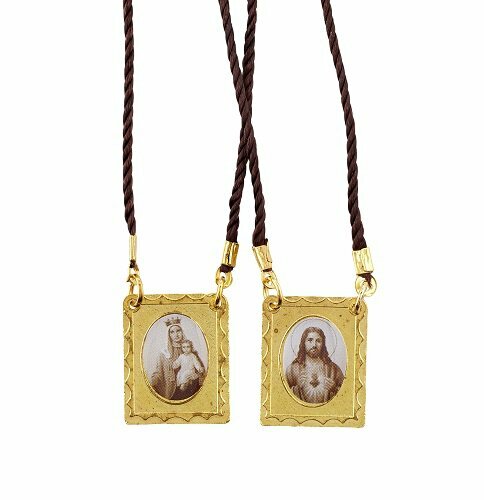 This unique scapular features gold-tone panels, traditional sepia artwork and woven cord for comfortable wearing.